Home » Fertility Video » Is Preimplantation Genetic Screening a Good Idea? Preimplantation Genetic Screening (PGS) is a wonderful technique for some couples who are experiencing multiple failed IVF attempts. I was recently asked if this is a good idea during IVF or just an extra they sell to patients. 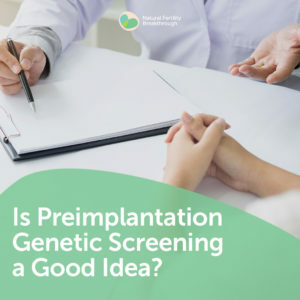 If you have experienced multiple failed IVF attempts or you have a medical history or a genetic mutation that you need to screen for, like cystic fibrosis for example, where you have a family history, where there’s a genetic legacy, definitely it’s a good idea to have preimplantation genetic screening (PGS). Then at least you know whether the embryos that you are going to be creating and transferring back are healthy. If you know that your embryos are not normal, you can then make a decision as to what to do next. I had a woman once who came to me. She was 46. She was adamant that she wanted to have a baby with her own eggs to begin with, and she was still responding really well. Her hormones were great and there was no reason for us to think that she wouldn’t be able to conceive. In fact, she had incredible success after doing our program with the response that she was getting through IVF. However, we did some extra cycles for embryo banking because she wanted to have ideally more than 1 child – ended up with about 8 embryos they were PGS tested and all of them were genetically abnormal. This woman previously had a Down syndrome pregnancy terminated at 12 weeks. She didn’t want to go through that heartache again, she wanted to know that the embryos to potentially transfer back were healthy and normal. The preimplantation genetic screening process enabled her to make a decision as to where to go next. In her case, she decided on doing a donor egg cycle and now she’s got beautiful twins. As in this case PGS can helps us make good decisions, clinically speaking about what needs to happen for a couple. Of course, if you are having difficulties or if you had multiple failed IVF attempts, then looking at what else could be getting in the way is really important. I’ve had a patient once who had had 19 failed IVF attempts, and in her case, it wasn’t a matter of doing PGS. It was actually a matter of addressing all of the cumulative factors that were getting in the way for them as a couple. Once addressed they conceived naturally and they now have a beautiful baby. There are many different things that can be done and things that you need to look at in order to optimize your chances. Preimplantation genetic screening may very well be one of them; however, it’s not the only thing. I would highly recommend if you’re going through IVF or if you’re trying to conceive and you’ve had multiple failed attempts that you look into doing the free Fertility Challenge because that’s really going to help to give guide your understanding around all the things that you can do to optimize your chances of having a healthy baby. Here’s the link to download a copy of the video transcript Is preimplantation genetic screening a good idea?